Our research interests are diverse and include cardiac dynamics, cellular signaling, cell motility, and chemotaxis. By navigating this site, you can find out more about our research, publications, and lab members. Composite of outlines of actual cell membranes moving to a pipette filled with a chemoattractant and position in the upper right hand corner. The outlines are color coded to show the time evolution. The inset shows a sequence of images of a chemotaxing cell in which both the actin network (red, and responsible for protrusive forces) and myosin (green, and responsible for contractile forces) is marked by a fluorescent protein. For more details, please see the Research section or our publications. Two post-doctoral positions are available. We are looking for someone who is interested in modeling cell motility. In addition, we are looking for post-doc interested in modeling cardiac arrhythmias. If you are interested, send an email to rappel@physics.ucsd.edu. Elisabeth has received a Human Frontiers fellowship. Congratulations! David has received an AHA fellowship. Congratulations! Brian has received an NIH fellowship. Congratulations! Monica's and Haicen's paper on cellular memory has appeared in PNAS. Please see the PNAS website for more details. Brian's paper on cell rotations has also appeared in PNAS. The abstract and pdf can be found here. Monica and Albert were co-organizers of the first ever Dicty World Race 2014. 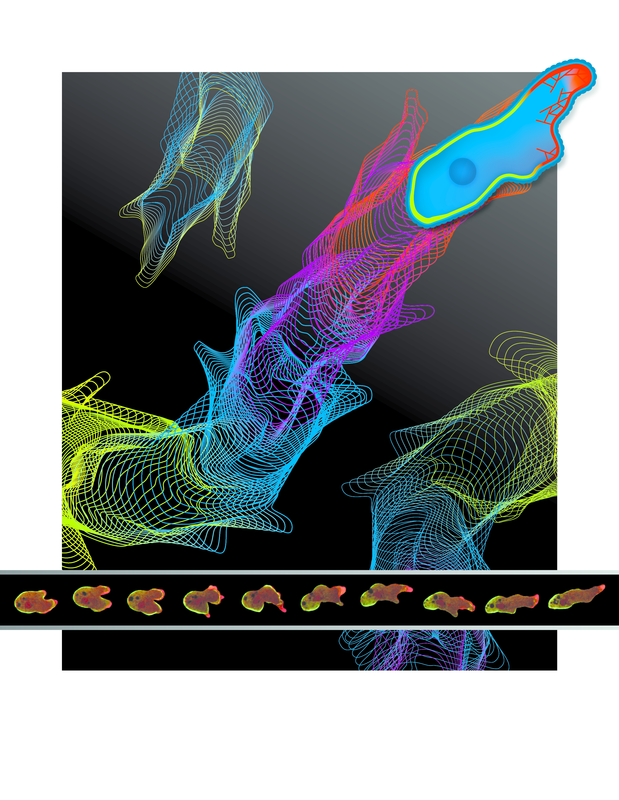 The race required cells to navigate a complex micro-fluidic maze to reach a pool of chemoattractant at the finish line. The challenge was to engineer Dictyostelium or HL60 cells to be both smart and fast! Please see the website for more details. Our ventricular fibrillation (VF) study has been published (David E. Krummen et al., Rotor Stability Separates Sustained Ventricular Fibrillation From Self-Terminating Episodes in Humans, J Am Coll Cardiol., 2014). Using high resolution basket electrodes, we mapped human VF in 26 consecutive patients. We found that rotors were present in the majority of patients and that the formation of stable rotors identifies individuals whose VF requires defibrillation from those in whom VF spontaneously self-terminates. Brian's paper on "Periodic migration in a physical model of cells on micropatterns" has been published Physics Review Letters (111, 158102, 2013). It is a collaboration with the group of Bo Li (mathematics, UCSD) and Herbert Levine (Rice University). It has been posted on the q-bio arhive (arXiv.org) , where it can be dowloaded .